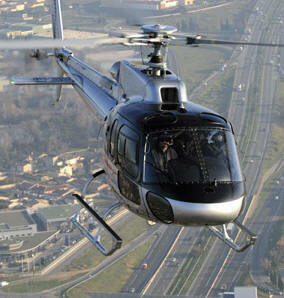 March 31, 2011 - The enhanced AS350 B3e is the next generation aircraft in the proven Ecureuil family of helicopters. Officially launched at Heli-Expo, 2011 the new version features a more powerful Turbomeca Arriel 2D turbo shaft engine, a new digital FADEC (Full Authority Digital Engine Control) and is fitted with an engine data recorder. ?The selection of the AS350B3e for Slave Lake?s operations was easy; the new helicopter fits well with our expansion plans because it gives us the ability to work effectively in mountainous regions and over larger territories? said Mr. George Kelham, Owner, Slave Lake Helicopters. ?Our customers rely on us to fly the latest in new technology aircraft?. The powerful, high-performance AS350 B3e is designed to carry out the most demanding missions in the most extreme weather and geographical conditions. Its exceptional lift capability, high endurance, extended range and fast cruise speed make the AS350 B3e the leader in its class. Unique to the AS350 B3e with the Arriel 2D powerplant is the opportunity to equip the AS350 B3e with engine filters for protection during flight in sand and snow conditions without a performance penalty. It incorporates tail rotor modifications for additional ease of piloting, and also features an improved interior design. The AS350 B3e is a member of Eurocopter's rugged and proven Ecureuil family. Some 4,900 Ecureuils have been delivered in 98 countries for some 1,600 operators. These aircraft have cumulated more than 22 million hours. More than 900 AS350 B3 series are currently in-service worldwide, and are mainly used for high performance missions in "high and hot" conditions. The new AS350 B3e will be based in Slave Lake, Alberta and will be utilized for forestry, oil support, tree planning and firefighting missions. The AS350 B3e will be delivered in 2012. Certification of the AS350 B3e is planned this summer, with deliveries to begin before year-end. It will be powered by the new Turbomeca Arriel 2D engine which offers high performance, reliability and low maintenance costs. The AS350 B3e cockpit will be fitted with a dual LCD-screen Vehicle and Engine Multifunction Display (VEMD), allowing the pilot to check at one glance the main vehicle and engine parameters - thus reducing his workload and enhancing safety. The use of composite material for the airframe, rotors and main rotor head gives the AS350 B3e the best protection against corrosion, as well as, reducing maintenance costs. Founded in 1988 Slave Lake Helicopters currently operate a fleet of five helicopters which includes multiple AS350B2?s and an EC120 B. Operating state of-the-art modern equipment and employing highly skilled AME?s and pilots has contributed to the growth and reputation of Slave Lake Helicopters in Alberta and across Canada. Eurocopter Canada Limited is a subsidiary of Eurocopter. Eurocopter Canada based in Fort Erie, Ontario, with operations in Richmond, British Columbia and Montreal, Quebec ? has a customer support network that spans the entire country. Eurocopter Canada celebrated 2009 as its 25th anniversary year.